Doors & door frames in commercial environments are particularly vulnerable to impact damage. The best way to combat the problem is to apply robust protection. Acrovyn has played a vital role in protecting commercial doors & frames for decades. With a broad range of aesthetic options on offer, it’s easy to combine protection with the desired look, whether it’s solid colours, simulated patterns or even custom graphics. Acrovyn door solutions significantly extend the service life of doors and help to reduced maintenance costs. Provide a durable protective skin for any door! Acrovyn door cladding (model 3DP) is a 1mm thick Acrovyn sheet supplied in standard door width / height with a 90 degree edge, designed to provide a durable, protective skin for any door. Acrovyn door cladding can be manufactured to project height requirements. An impact resistant door surface can significantly enhance aesthetics while helping to reduce maintenance and repair costs. Range of solid colours & patterns to choose from. Full height protection to both sides. Partial heights are also available for one or both sides. 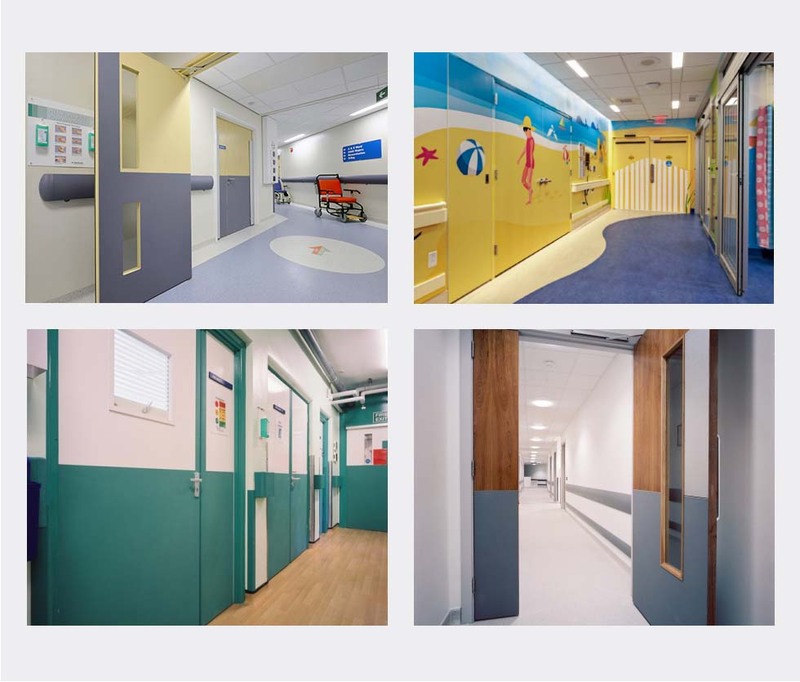 Easy to incorporate signage, messaging & photographs: (doors can even act as part of a full mural with the use of ‘Acrovyn by Design’ – see image top right). Be sure to order two pieces to protect the entire door. Can be placed in any position on the door to provide protection where it’s most needed! Custom kick plates and push plates are manufactured to your specification using 1mm or 1.5mm Acrovyn, and can be placed in any position on the door. They are designed to provide vital protection to the most used and most vulnerable areas of a door. Kick and push plates absorb impact and abrasions so the door doesn’t have to. Create custom shapes and features for your doors: available in almost any size or shape. Available in environmentally friendly, PVC free Acrovyn 4000 as standard. Available in all Acrovyn colours. Suitable for retrofitting to existing doors. Kick plates (model 1-DP) are supplied with 25.5mm clearance at both jambs. Help reduce damage & minimize repair costs! Door edges are one of the most vulnerable parts of the door, frequently coming in contact with passing equipment. Damaged door edges are unsightly and pose a potential safety hazard, particularly in relation to the integrity of fire rated doors. Acrovyn edge protectors help reduce damage and minimize repair costs. Edge protectors absorb impact and abrasions so door edges don’t have to. The edges remove easily for replacement or repair. Simple installation with concealed fixings. Available in a wide range of Acrovyn colours. Supplied with fire and / or smoke seals. Significantly increases the lifespan of the door. Suitable for 30 minute or 60 minute fire rated and non-fire rated doors. Full or partial height protection for many different frame styles! Like door edges, door frames are also one of the most vulnerable parts of a doorway, frequently coming in contact with passing equipment. Damaged door frames are unsightly and pose a potential safety hazard, particularly in relation to the integrity of fire rated doors. Acrovyn door frame protectors help reduce damage and minimize repair costs. 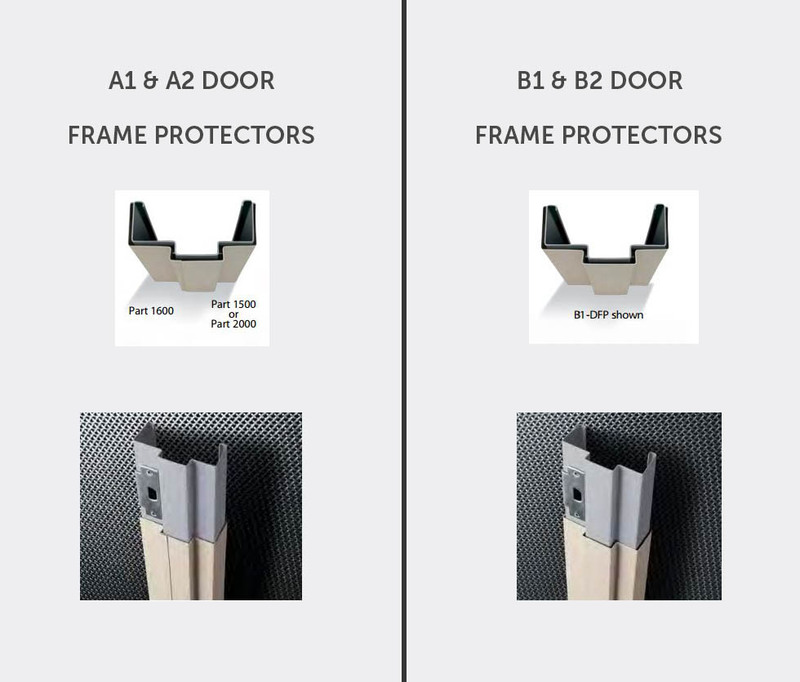 Door frame protectors absorb impact and abrasions so door frames don’t have to. Built up from a series of channels and angles to fit specific door frame size requirements. Many different frame styles accommodated, including wooden frames and architraves. Full or partial height protection can be supplied. Suitable for retrofitting to existing door frames. Significantly increases the lifespan of the door frame. Models A1-DFP and A2-DFP are rugged two-piece custom-formed 1.6mm Acrovyn sections designed to fit 80% of common metal door frames. Built up from a series of channels and angles to fit specific door frame requirements. Models B1-DFP & B2-DFP are rugged three-piece custom-formed 1.6mm Acrovyn sections. Specify model B1-DFP for extended frame models with returns to wall. Specify model B2-DFP for flush frame to wall configurations. One-piece guards, custom formed to the radius configuration of the elevator door frames! Constant pedestrian passage and equipment manoeuver through elevator doorways, leaves elevator entryways susceptible to damage. 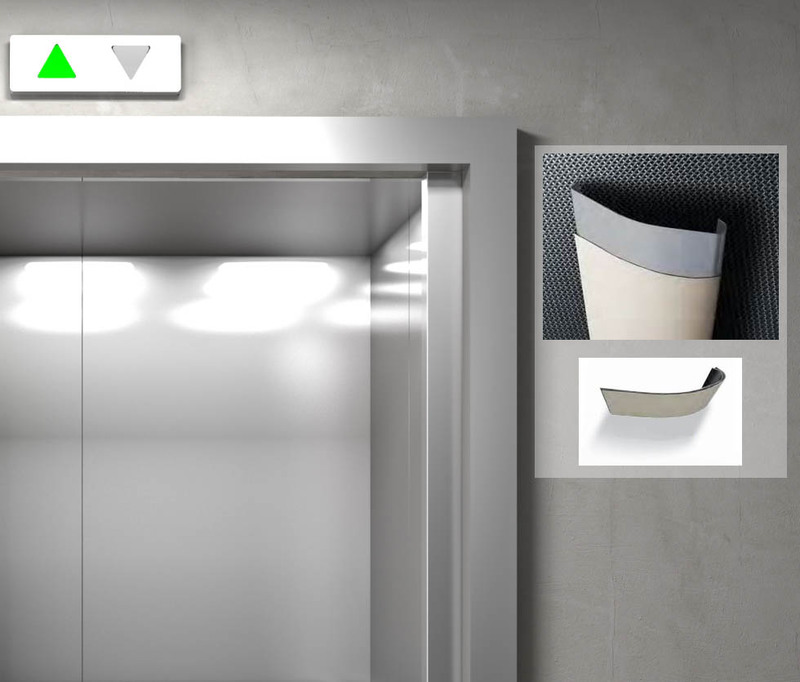 The best way to help minimize damage is to install custom elevator guards. One-piece elevator guard is custom formed to the radius configuration of the elevator door frames. Supplied with field applied adhesive. Available in solid Acrovyn colours and patterns.